Please note: Tent camping is not allowed. Sites are for RVs/Travel Trailers only. Current rate is $30.00 per night, plus 10% TOT tax due at check-in and prior to entering facility. Pet fee is $2.00 per night. WiFi and use of dump station included. Rates subject to change without notice. Maximum stay is 14 nights. Must vacate at least 7 days prior to returning. Upon arrival each Owner, authorized guest, or member of the general public must first register at the office and present their photo identification and/or driver’s license, vehicle registration & insurance. RVs must be in good working condition and clean (no missing or broken glass, doors or vents.). Cloverdale Citrus Fair reserves the right to refuse service to any RV based upon its appearance and/or condition. One vehicle is allowed at your RV site. Any additional vehicles must be parked outside the Citrus Fair gate. Speed limit is 5 miles per hour. Quiet hours are 10pm to 8am. No generators to be run during quiet hours. Pets must be leashed and under control at all times. Pet waste must be picked up and disposed of immediately. Children must be supervised at all times and are not allowed to play in barns, restrooms or buildings. No riding of bicycles, skateboards or use of remote control vehicles allowed. Parents/Guardians are responsible for any damages caused by their children or guests. No clutter is allowed around RV space. Trash must be put into cans provided. Red cans must be used for disposal of smoking materials. Facilities are for registered guests only. Only registered guests allowed to stay overnight. Visitors allowed between 8am and 10pm. Water and sewer connections must be in working order with no leaks. No work on RV’s or tow vehicles may be done on premises. Washing of vehicles or RV’s is not allowed at any time. No campfires or charcoal fire pits allowed. No alcoholic beverages are allowed outside of RV space. Check out time is noon. Another night will be charged after that time. The restroom has a combination lock. Please close the door behind you. Registered guests will be given the combination number upon check-in. 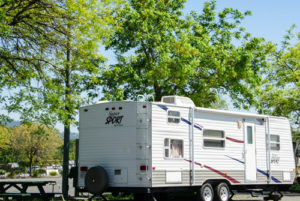 Pursuant to the California Recreational Vehicle Occupancy Law, the recreational vehicle of any RV occupant may be removed from the premises without a judicial hearing upon 72 hour written notice to occupant for failure to pay for such occupancy or failure to comply with the rules and regulations of the park. Civil code sections 799.22, 799.43 and 799.58. Cloverdale Police Department phone (707) 894-2150. Guest expressly releases the State of California, Cloverdale Citrus Fair Association their directors, officers, agents, servants and employees of any liability for any injuries or property damages sustained by guests, visitors and children as a result of their use of these premises and facilities. Management reserves the right to modify these policies without notice, refuse service at any time, for any reason and reserves the right to evict any guest without refund for non-compliance with these rules.